This is a joint giveaway with WaldenMommy: Life Behind the Red Front Door and Natural Parents Network. You may enter at one site only. Please find the section marked “Win it!” for the mandatory entry and optional bonus entries. 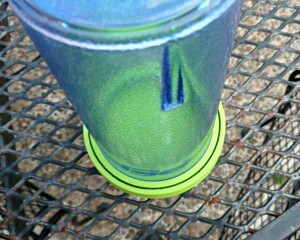 GreenPaxx is offering two of our readers a giveaway of one Cool Cap and two Cool Straws, a value of $19.90 total. 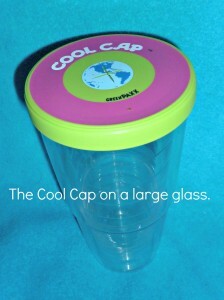 The Cool Caps are large, flexible lids that fit over a variety of cups or glasses. 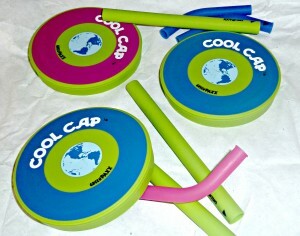 The Cool Straws are two piece straws that are flexible and can be used alone or with the Cool Caps. Both items are portable, flexible and reusable! I received three Cool Caps and three Cool Straws for my review. Two of the Caps and Straws are blue and one was pink. Of course, the Princess wanted the pink ones and her brothers claimed the blue! GreenPaxx was started by a mom of four who is also a nurse. She was looking for a way to get more fruits and veggies into her children and started making them green smoothies. After one too many spills of those lovely, organic smoothies, she invented the Cool Caps and Cool Straws. The company’s mission is to create toxin-free products that replace disposable, one time use items and give people greater control over what toxins leach into their foods. 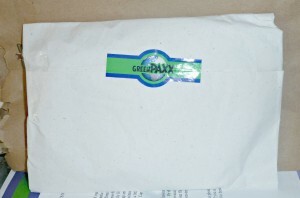 The products arrived in GreenPaxx’s attractive and eco-friendly packaging. The tissue paper was sealed with a GreenPaxx sticker. The entire look was very professional and I was happy there were no boxes to recycle! I even saved the tissue paper to re-use for gifts or art projects. My kids immediately put these items to use. With a little help from GreenPaxx’s “how-to” video, we learned how to put the Cap on our drinking glasses. We used the “outer rings” for our super-sized drinking glasses and “inner rings” for some of the smaller ones. using the "inner rings" for a smaller drinking glass. My toddler especially loved being able to drink from a “grown-up” glass at dinner and I loved the Caps and Straws prevented spills! We took the Caps and Straws with us on a road trip and they were great when we were visiting family. 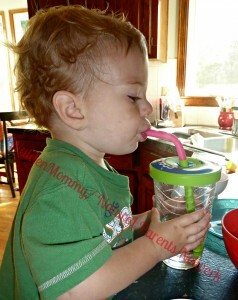 We were able to turn regular drinking glasses into spill-proof cups for our younger two. It was great not having to lug sippy cups with us everywhere and not have to worry about the children spilling liquids all over the dinner table. Baby Bear using the Cool Cap and Cool Straw on a standard glass. I also used these Caps and Straws for my three year old son, who has Childhood Apraxia of Speech. PuddinPie really likes his milk and will only drink it out of a sippy cup. A regular glass with the Cap and Straw looked like the glasses his older siblings used but had some familiar elements of his sippy cup. I was able to get him to drink a little water with the Cap and Straw. We’re hoping the Cool Cap and Cool Straw will help him accent other liquids. My Princess, age six, is a somewhat picky eater. She likes vegetables but not always. I mixed up a special “Jayhawk Smoothie” using strawberries, blueberries, vanilla yogurt . . . and a special green juice that contains kale and broccoli. She drank it up and asked for seconds! I was so pleased that I got a “green smoothie” in her and that the added novelty of the Cap and Straw helped. The Cap and Straws are very easy to wash. I especially love that the rings of the Cap flip up for easy washing… and no goop left in the crevices! The Straws are in two pieces, which, again, makes for easy clean up. They are soft and flexible, so they are easy to pack, especially for trips or when you are on the go. Fairly universal, which means that they fit with many of my existing cups. Not having to play, “Is this the right lid and straw for this glass?” saves me a ton of time! 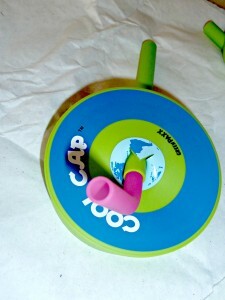 The Cool Cap can be used with disposable straws, if needed. The Cool Straws can be used alone. I’ve been known to take the Straw and stick it in my own smoothie! A wider straw means it is easier for kids to drink from. I think this Straw would be great to help children with oral-motor challenges. People of all ages, from little ones just learning to drink from a straw to adults, can use this product. There is nothing especially “kiddie” about the design or colors, so an adult won’t feel like they are using a child’s product. It’s a product for the whole family and one your child won’t grow out of. For the price of one Cool Cap and Cool Straw, you could save several thousand disposable lids and straws from the landfills! These would make fun party favors (especially if the guests were able to decorate their own glass! ), stocking stuffers or to go in an Easter basket. The lid does not fit every glass or cup. While it fit my bigger glasses, it would not fit my reusable cups from the ballpark. They were just a touch too big. They also “curl” off some of the bigger glasses. I would place it on the drinking glass and it would “curl” away mid use. I would just pop it back on but, if a child was using the Cap, it would mean that the liquid could easily spill out. Only two colors. I would love to see more colors so I could color-code my kids’ cups. However, you can write their names on the edge of the Cap or on the Straw. My two year old could get the Straw apart, so little ones who still love to put things in their mouths would need to be watched. Overall, I really love this product. It is fun and easy to use. It’s great that it is universal and can be used for a variety of drinking glasses. It is portable and perfect for road trips. I think a few of these may end up as gifts for some little people in our lives! You can purchase your own Cool Cap and Cool Straws at GreenPaxx. A two-pack of Cool Caps in either blue or pink is 9.95. A four-pack of Cool Straws in blue or pink is also $9.95. 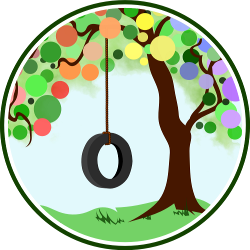 And just for Natural Parents Network and WaldenMommy readers GreenPaxx is giving a 20% discount on all orders from now through July 29, 2012. Enter code NPN during the ordering process. For your own chance to win a Cool Cap and Cool Straws from GreenPaxx, enter by leaving a comment and using our Rafflecopter system below. The winner will receive a Cool Cap and two Cool Straws. Contest is open to the United States only. MANDATORY ENTRY: Visit GreenPaxx and tell us one thing you have learned about the company! You must enter your name and email address in the Rafflecopter entry system for your entry to count, after leaving a comment on this blog post. This is a joint giveaway with WaldenMommy: Life Behind the Red Front Door and Natural Parents Network. You may enter at one site only, and we’ll be recording IP addresses to ensure that there are no duplicate entries. That said, please do visit and enjoy both sites! Contest closes July 29th at 11:59 p.m. Eastern Time. Laura is most often found driving her herd of four small children around mid-western suburbia or tackling Mt. NeverEndingLaundry. Online, she blogs at Walden Mommy: Life Behind the Red Front Door about her life with The Herd, her Engineer Husband and their pesky dog; her faith; and dealing with post-partum PTSD following the premature birth of her third child. A natural birthing, breastfeeding, baby-wearing, semi-co-sleeping, healthy eating, green living hippie who likes shopping and shoes, she doesn’t claim to be a perfect mother . . . but is the perfect mother for her children. Unfortunately the green-paxx website does not load well on my iPad. I like that it’s a family owned company! The smoothie pack looks cool! I’d love to hae my niece try this out! The straws are made from non toxic food grade silicone. My 3 year old will enjoy them with her green smoothies! I like the smoothie gift pack. I like the sealed caps too. We’d get a lot of use out of those in my house. I have two daughters who will use these. Our whole family will probably mess with it at some point. smoothie gift basket looks great! my 19 month old daughter for sure!! I want these!! I like the COOL STRAWS PINK. I like the smoothie gift basket.